Conduct Requiring NO Apology is the Accepted Rule! Qualifications: Married couples, single men and single ladies of good reputation and character are invited to join Beechwood, Single men and single ladies are accepted on an equal quota basis. 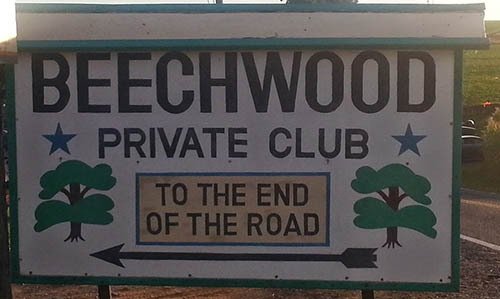 Prospective members are always welcome at Beechwood, however, in order to arrange a complete tour of the facilities, we suggest that arrangements be made in advance with the management. Registration: Everyone is required to register at the office upon arrival at Beechwood, non-resident travel trailer and mobile home owners included. Non-members must show proper driver’s license and I.D. Ground fee day ends at dark, unless you have a room or campsite. Check out time in rooms and at campsites is 24 hours after check in. Mobile Home and Travel Trailer: When considering being an owner of a mobile home, camper, or travel trailer, you must be a member in good standing of Beechwood. Parties are to meet with Mae and Dee for an application if site is available or vacated. All lot rent and membership dues must be paid in full at time of purchase. Fire: Fire is one of our greatest hazards. Be sure when you dispose of smokes or matches that they are out and placed in provided containers. Do Not leave books of matches or lighters lying around. Before building a fire of any kind, be sure to consult the management. Photography: Our rules on photography are simple be vital. They are based on years of experience to protect you as well as us. No one may photograph you without your consent; in addition, permission must be obtained from the management. Likewise, you must not photograph anyone unless you are fully authorized. Prospective guests may not be photographed and they are not permitted photography privileges. For further information on this subject, consult management. Firearms: Firearms, including ‘BB’ or pellet guns are not permitted on the grounds at any time. Pets: Dogs or other domestic animals without leashes are prohibited on the grounds. Pets are not allowed in the recreational areas, they are permitted only by your mobile home, campsite, or car. Vehicles: Speed limit is 5 mph at all times. Avoid blocking driveways, walkways and roads. Swimming: Special rules are posted at the pool. Smoking is allowed only at the table in the pool area. Smoking and drinking of any kind is not allowed in or by the pool. Everyone must shower with soap before entering the pool. Use the pool at your own risk!!! Sports: Our aim is to have all sports activities characterized by good sportsmanship. A poor sport spoils his own and everyone else’s fun. No smoking on any court. Children: Children are not allowed in the office area without their parents Curfew is 10:00 pm. All parents are responsible for their own children’s safety, conduct and activities and will hold Beechwood harmless for all liabilities. Sauna: No food, drink or smoking in the sauna. Remove all metal objects; glasses, necklaces, watches, earrings, etc(burn hazard). Hot Tubs: No food, drinking or smoking in the hot tub room or the outside screen house. Children under the age of 15 must be accompanied by an adult. Please shower with soap before using facility. Last person out is responsible for turning off the jets, lights, and replacing cover. Beverages: No soda, beer or alcoholic beverages in pool, sauna, or hot tubs. Glass containers are only allowed in the dining room and the Cow Palace on dance nights. Paper, plastic and cans are acceptable. Towels: Nudist etiquette requires everyone to carry a towel for sitting purposes and personal hygiene. If you forget to bring one, the office has towels for rent at nominal cost. Alcohol: Excessive use leading to obnoxious or belligerent behavior will not be tolerated!!! Under-age drinking is illegal. Violators and parents will be dismissed immediately. Check the dining room for upcoming events.